Realism: With the exception of the metal stick magazine, the Gletcher seems to have all it's other parts in order, even a working Toggle with Blowback, although the toggle does not lock back on the last shot! The Gletcher P08 certainly looks the part of a Luger P08, Gletcher has hidden the inner barrel by recessing it a little bit and the CO2 screw is well hidden under the magazine. It would have been nice to have been able to field strip the gun, but perhaps people will get into less trouble losing parts without this ability. This is the third Gletcher pistol I have reviewed and I am really liking their products! I like that they offer some very unique Airguns that many other companies are not addressing. My Gletcher P08 does have some competition from Umarex and KWC but it has its own selling points for sure, I figure it fits in nicely right between the Umarex and KWC P08's in terms of offering realism and practicality. 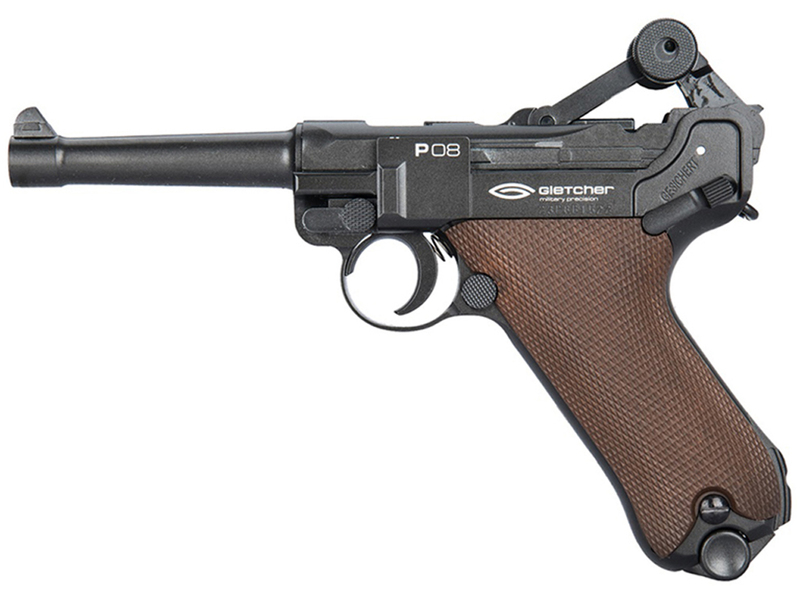 So now we have a few choices when it comes to purchasing a 4.5mm CO2 BB firing P08 Luger, choice is a good thing! 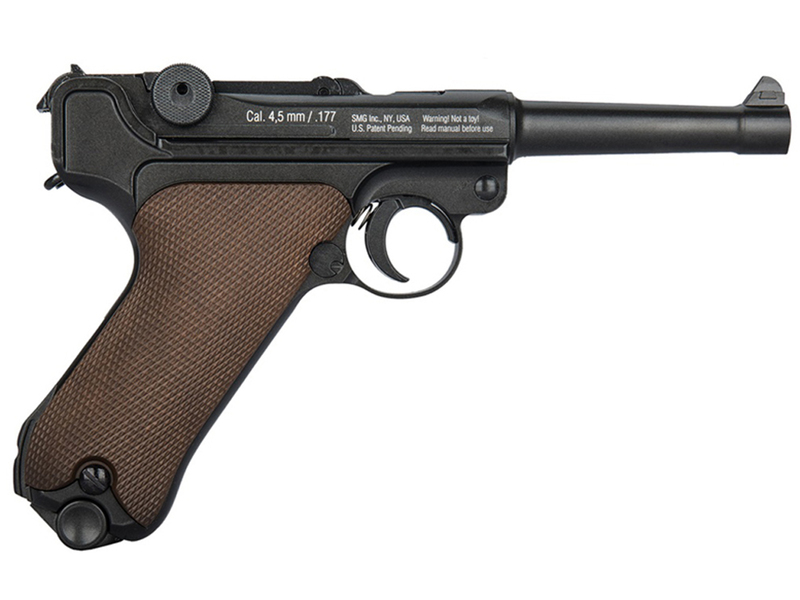 This gun has a few little quirks but all around a real nicely made and reliable pistol. Shoots accurately at close range like my basement shooting range. Also works really well if you don't load the mag completely full. I get 45 shots from one co2 cylinder which is still much cheaper than firing my 22lr Luger. This gun is also much easier on ones ears when shooting indoors. For shooting at targets indoors this gun is every bit as accurate as my Erma 22 Luger. This gun also doesn't jam like my jam-o-matic Erma. This gun looks great, is very reliable, plenty powerful for what I do and is surprisingly well made. Field stripping is simple if you know the trick of loosening the very small Allen screw that holds the pin that the very rear of the toggle pivots on and removing that pin to the left side of the gun. 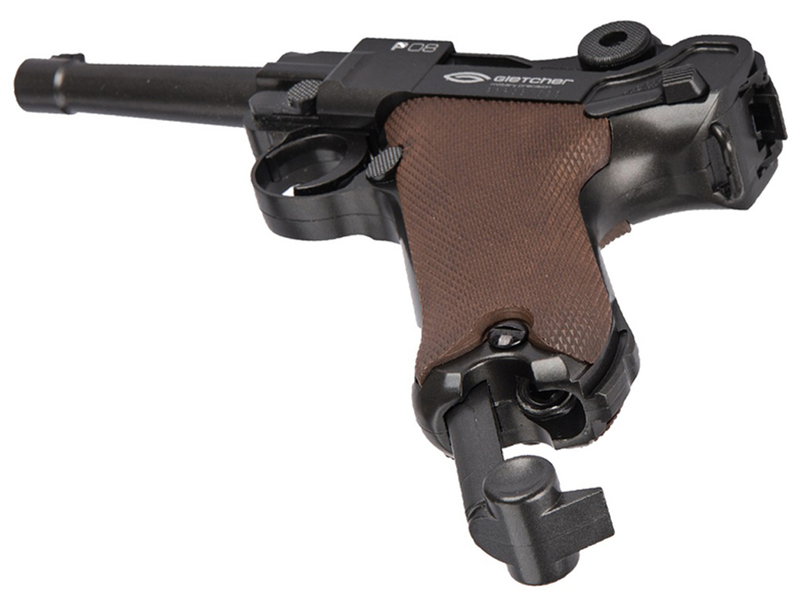 Do this after rotating the front takedown lever on the front of the frame downward and removing the magazine. One more thing, always load at least 2 bbs in the magazine, if only one it will just fall out. http://www.ReplicaAirguns.com - Gletcher P08 Luger CO2 Blowback 4.5mm BB Pistol Table Top Review. -21 Round Full Size Drop Out Metal Magazine. 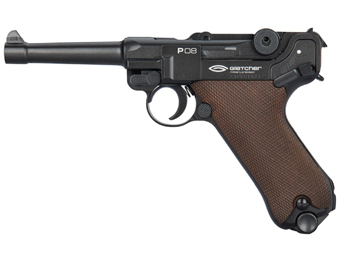 This video is a walkthrough review of the Gletcher P08 Luger CO2 BB Pistol. I show off this BB Replica close up from all angles and point out the mostly metal construction and go through the features and benefits of this very unique and historic replica BB pistol.